Our furry household members, those we call our pets, are an essential part of most American families. They enrich owners’ lives and, with each wagging tail or purr, bring a smile to our faces. Some pets are workers and enjoy helping their human friends while others prefer to lie around the house on a comfy chair. Whatever their preference, pets give unconditional love and aim to please. Having a healthy and happy pet can also be expensive. As a pet owner, I know how much it costs not only to feed one dog and three cats, but also the expense of pet care. Annual exams, grooming and special vet visits are not cheap. Throw in the various types of food and it can add up to a small fortune. According to the ASPCA, the average cost of owning a medium size dog is approximately $1,500/year and a cat costs roughly $1000/year. With the country’s current economy, it’s no wonder that people are forced to make the gut-wrenching decision to relinquish their pets to shelters, some of which are already filled to capacity. How can a pet owner become a client at the Food Bank? McHugh stresses that because of tougher economic times, it puts a strain on the availability of pet supplies and notes, “Our client base has [exploded]–from serving roughly 300 pets and their owners per month to 1300.” Additionally, requirements have become stricter. Pet owners must present proof of household income, a license or photo ID, current dog license, rabies vaccination certificate as well as number and description of animals in the household. If the pet does not have current vaccinations, the Food Bank holds low-cost vaccination clinics four times per year and will also steer owners to clinics at local animal shelters. McHugh says, “A second goal of the Food Bank is to educate the public about the importance of pet health through vaccinations as well as population control through spaying and neutering.” She is also personally involved with feral cat control, holds spay and neuter days and even fosters animals in her own home. The Animal Food Bank is currently in need of volunteers who can assist with carrying large pet food bags as well as other heavy items. With the dramatic increase in clients, the Food Bank hopes to one day have a larger home. McHugh’s dream is for the Food Bank to operate out of a larger space perhaps a former medical office or building that will allow room for a food bank, low-cost vaccine and spay/neuter clinic, pet gift shop as well as the ability to host monthly pet adoption fairs. In the meantime, the Animal Food Bank will continue to strive towards keeping pets and their families together. The Animal Food Bank of the Lehigh Valley is housed at The Fowler Family Southside Center of Northampton Community College, Room 73, located at 511 East Third Street, Bethlehem. 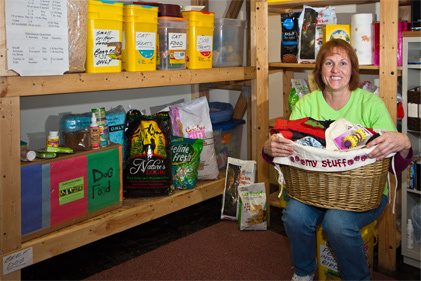 Clients may pick up pet food and supplies on the 2nd, 3rd and 4th Fridays of each month from 1:00 to 5:00pm. Pet donations can be dropped off at the same time, however, if those times are not convenient, you are encouraged to call the Food Bank (484-851-8000) and arrangements can be made for pick-up of your donations.